Michael Woods and Diffused Music bring together Paul Thomas and Andrew Bennet for their next release. 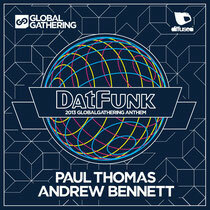 Paul Thomas, fresh off the back of his release on Funkagenda's Funk Farm, joins up with Diffused HQ favourite Andrew Bennett for this year's Global Gathering official anthem, ‘Datfunk’. Both producers’ productions skills are on point as reverbing stabs turn into layered synth chords before evolving into a twisting bassline, ready for that hands in the air moment. Already big for many DJs, and with Global Gathering bringing another massive line up to the UK this year, this is sure to be huge over the forthcoming months. Check it out below.